FAYETTEVILLE, Ark. – The University of Arkansas Honors College will host a new round of “Signature Seminar” courses taught by the U of A’s top scholars and leaders in Fall 2017. Offerings will include “Race: Rediscovered, Unresolved,” led by Charles Robinson, vice chancellor for student affairs and professor of history; and “Cancer: A Constellation of Disease,” taught by Timothy Muldoon, assistant professor of biomedical engineering. 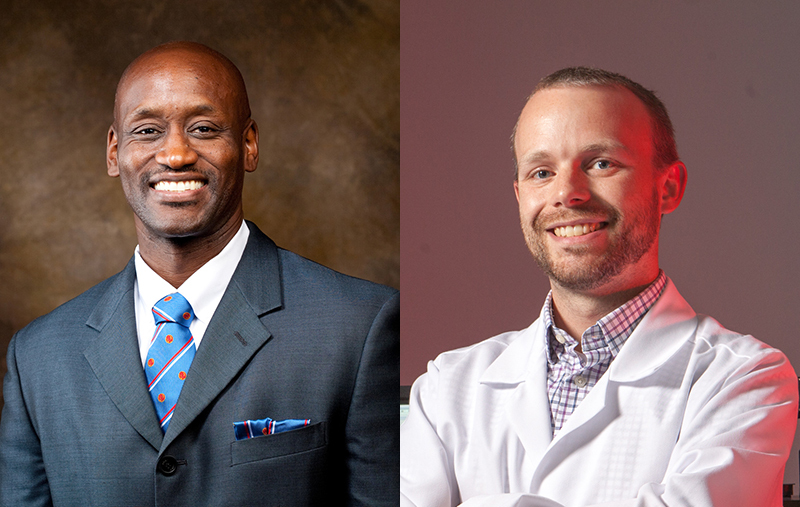 Charles Robinson will present a public forum giving an overview of the course at 5:15 p.m. on Wednesday, Feb. 1, and Timothy Muldoon will follow suit at 5:15 p.m. on Wednesday, Feb. 8. Both lectures will take place in Gearhart Hall Auditorium (GEAR 26), and all on campus and in the community are invited to attend. The Signature Seminars, designated HNRC 4013H in the university’s Catalog of Studies, launch this spring with “Teeth: Evolution’s Bite,” offered by Peter Ungar, Distinguished Professor of anthropology in the J. William Fulbright College of Arts and Sciences, and “Prosecution: (Un)Making a Murder,” led by Brian Gallini, associate dean for research and faculty development in the School of Law. Future Signature Seminars topics being considered range from illuminated manuscripts to the Internet, hunger, water, and Jesus. Deans of each college may nominate professors to participate, and those who are selected to teach will become Dean’s Fellows in the Honors College. Robinson, nominated by Chancellor Joseph Steinmetz, has been designated a Chancellor’s Fellow in the Honors College. Over time, the Honors College plans to bring in leading scholars from other institutions to teach some of these courses, as well. Honors students must apply to participate, and those selected will be designated Dean’s Signature Scholars. The course applications are posted online on the Signature Seminars web page. In his seminal work The Souls of Black Folk (1903), noted African American scholar and journalist W.E.B. DuBois predicted that managing issues tied to “the color line” would prove to be the most salient challenge for the United States and other white western nations throughout the twentieth century. Numerous events around the world demonstrated the profound accuracy of DuBois’ early forecast. As the decades of the century passed, people with dark skin fought globally for political independence. In the United States, African Americans struggled to gain political voice, social and economic rights, and equal protection before the law. The 2008 election of the nation’s first African American president, Barack Hussein Obama, motivated many pundits to opine that serious “color line” challenges had ended. 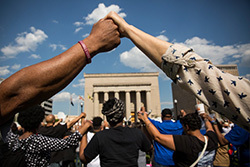 Today, the vast number of highly publicized police shootings of unarmed African Americans and the array of race-related protests on college campuses reveal not only the unchallengeable relevance of race but also a nation searching for adequate remedies to address this pandemic scourge. The ascendency of Donald Trump to the nation's highest office following a campaign of divisive rhetoric related to race and religion has completely silenced the post-racial proponents. The purpose of this course will be to examine the historical evolution of race in the United States and to analyze its lingering impact on systemic functions, popular attitudes and the national identity. In the United States in 2017, there will be more than 1.5 million newly diagnosed cases of cancer, and nearly 600,000 people will die from the disease. One out of three people will be diagnosed with some form of cancer during the course of their life. Annual expenses for the medical care of these patients will total more than $125 billion. Despite these daunting numbers, we are at the cusp of a revolution in the way we understand, diagnose, treat, and present cancer. Cancer is not a single disease but rather a bewildering constellation of various classifications and subtypes. Any cell type in the body may lead to its own unique form of cancer, and even two people with exactly the same type and stage of cancer, treated in exactly the same way, may not have the same outcome. Despite these challenges, we have never understood the basic biology of cancer better than we do now, and current research has led to great strides in the way we treat – and often cure – many types of cancer. Significant questions remain: How do we allocate limited resources to combat cancer? Can we better treat patients as a whole person, rather than just their disease? Are we as a nation prioritizing the right things when it comes to treating an aging population? This course will explore these broad and complex issues that cut across science, medicine, industry and society. Visit Signature Seminars on the Honors College website for more information on these courses and the professors who will teach them.